About to treat a gastric dilatation-volvulus (GDV) patient? Not sure if you should pass an orogastric tube or trocharize the patient? Ultimately, it's clinician preference, but VETgirl typically prefers to trocharize our canine GDV patients. First, it's easier. Second, it alleviates a lot of gas off the stomach and may actually help you pass an orogastric tube even more easily. Third, it provides patient comfort very quickly. Fourth, it doesn't require much equipment (juts a 14 or 16 gauge catheter!). Fifth, it doesn't require sedation. Lastly, it's less stressful to the patient and you're less likely to cause esophageal or stomach injury from the orogastric tube! So, how do we trocharize? Locate the most tympanic region (estimating where the stomach is), avoiding the spleen. Clip and use sterile preparation of the region, as aseptic technique is imperative. A large gauge needle or catheter (e.g., 14 or 16 ga.) should be directed into this area to alleviate gas from the stomach; the sound of hissing gas indicates appropriate placement into the stomach. Rare complications can be seen secondary to trocharization including splenic laceration, gastric perforation, or septic peritonitis. 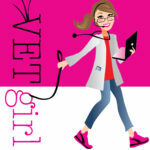 You can check out our VETgirl video of how to trocharize here (Access for VETgirl ELITE members only, sorry!). If you prefer to pass an orogastric tube, no problem. Just make sure your patient has been appropriate stabilized prior to administering some analgesia/sedation for orogastric intubation (ideally something reversable or that can be used as your pre-medication prior to anesthesia). But in reality, does it make a difference which modality you pick? Goodrich et al out of University of Minnesota wanted to compare these two gastric decompression modalities and evaluated dogs undergoing orogastric intubation versus trocharization in 116 dogs with GDV. In this study, decompression was performed via orogastric tubing in 31 dogs, gastric trocarization in 39 dogs and a combination of both in 46 dogs. Orogastric tubing was successful in 59 (75·5%) dogs and unsuccessful in 18 (23·4%) dogs. Trocarization was successful in 73 (86%) dogs and unsuccessful in 12 (14%) dogs; none of these dogs required sedation. No evidence of gastric perforation was noted at surgery in dogs undergoing either technique. One dog that underwent trocarization had a splenic laceration identified at surgery that did not require treatment. Esophageal rupture or aspiration pneumonia was not identified in any dog during hospitalization. No statistical difference was found between the method of gastric decompression and gastric compromise requiring surgical intervention or survival to discharge. So, regardless of which you prefer, both are apparently safe and associated with a low complication rate! Whatever type of gastric decompression you chose, make sure to fluid resuscitate your patient first (or simultaneously). P.S. In VETgirl's opinion, all dogs should be sedated for orogastric intubation unless comatosed or obtunded to prevent undue stress and anxiety to the patient. 1. Goodrich ZJ, Powell LL, Hulting KJ. Assessment of two methods of gastric decompression for the initial management of gastric dilatation-volvulus. J Sm Anim Prac 2013;54(2):75-79. Ideally, you should NOT be getting fluid and ingesta with trocharization! Only gas – go to a more tymphanic area.